The heart may hide, but it never forgets. 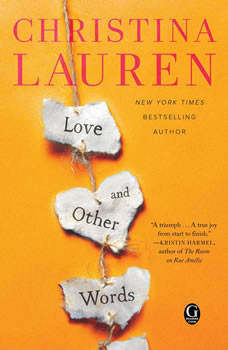 The first women’s fiction novel from New York Times and #1 international bestselling author Christina Lauren (Autoboyography, Dating You / Hating You).Macy Sorensen is settling into an ambitious if emotionally tepid routine: work hard as a new pediatrics resident, plan her wedding to an older, financially secure man, keep her head down and heart tucked away. But when she runs into Elliot Petropoulos—the first and only love of her life—the careful bubble she’s constructed begins to dissolve. Once upon a time, Elliot was Macy’s entire world—growing from her gangly teen friend into the man who coaxed her heart open again after the loss of her mother…only to break it on the very night he declared his love for her. Told in alternating timelines between Then and Now, teenage Elliot and Macy grow from friends to much more—spending weekends and lazy summers together in a house outside of San Francisco reading books, sharing favorite words, and talking through their growing pains and triumphs. As adults, they have become strangers to one another until their chance reunion. Although their memories are obscured by the agony of what happened that night so many years ago, Elliot will come to understand the truth behind Macy’s decade-long silence, and will have to overcome the past and himself to revive her faith in the possibility of an all-consuming love. Christina Lauren is the combined pen name of long-time writing partners/besties Christina Hobbs and Lauren Billings. The coauthor duo writes both Young Adult and Adult Fiction, and together has produced thirteen New York Times bestselling novels. They are published in over 28 languages, have received starred reviews from Kirkus, been selected as one of NPR’s Top 100 Swoon-Worthy Romances, and won both the Seal of Excellence award and Book of the Year from RT Magazine. Lauren Billings has a Ph.D. in neuroscience and before she made writing her full-time job, would spend her days doing nerdy research-type things wearing a lab coat and goggles. Christina Hobbs used to spend her days in a junior high counseling office surrounded by teenagers. These days you’ll probably find her on tumblr. Both are married with children and always joke that Christina steals Laurens shoes.